Through Steve’s Club and CrossFit, a high-schooler found discipline, community and hope for the future. Kevin accomplished two major goals in one week: he graduated from high school and got a muscle-up. Both accomplishments were the result of perseverance, hard work and some help from Steve’s Club National Program. Steve’s Club is a national network of programs that makes it possible for underserved youth of any socioeconomic background to join in the CrossFit community at reduced, low or no cost. 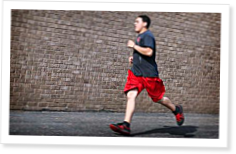 Teens from tough neighborhoods and difficult family lives have the opportunity to be involved in fitness and other positive outlets instead of drugs, gangs and violence. After school, they go to their local CrossFit affiliate, where they sweat alongside other members of their local community. Kevin moved to the United States in 2005 from Puerto Rico and has been working out with Steve’s Club Camden since 2011. His neighborhood reflects some of the challenges we see many Steve’s Club athletes facing. Get ready for a svelte Gary Roberts. After two months and 24 days of CrossFit, he’s down about 70 lb. to right around 203 lb. Aaron Carr explains how 65-year-old Bruce Hughes discovered the true price of CrossFit after a year at CrossFit Cedar City. A mother and son strengthen their bond through a shared love of CrossFit. Hilary Achauer reports. Jeremy Striffler explores turning a loss into a win.